Expert advice on how to attach a patio roof to a house, with step-by-step instructions and construction diagrams. Patio roof connects to a ledger that firmly attaches to house framing. A house-attached patio roof takes advantage of the house’s structure by supporting one end of the roof on a ledger mounted horizontally to the house. The ledger, typically a 2 by 6, is usually designed to hold one end of the patio-roof rafters. Locating and mounting the ledger is normally a fairly easy process; the ledger should be attached before the foundation is built for a deck, patio roof posts, and other struture. 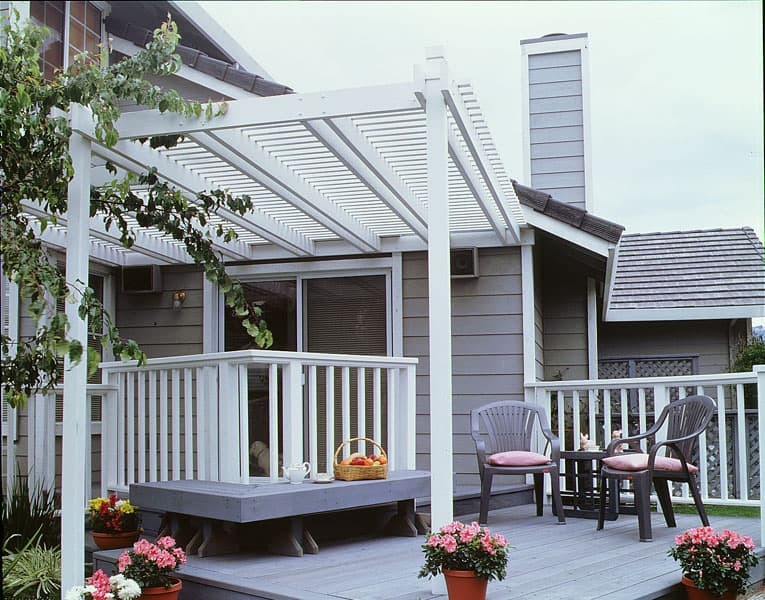 On a one-story house, it is often best to attach the ledger for a patio roof just below the house’s eaves. On a two-story house, you can usually tie the ledger into a band joist (also called a rim joist), located between the floors, as shown below. Find the band joist by measuring down from a second-story window. If you have beveled horizontal siding, then use an inverted piece of siding, as shown in the illustration here, to create a plumb, flat surface for attaching the ledger. Use an inverted piece of cedar siding to create a flat surface for attaching the ledger over lap siding. A ledger should be affixed to strong parts of the house’s framing, such as second-floor joists or wall studs. 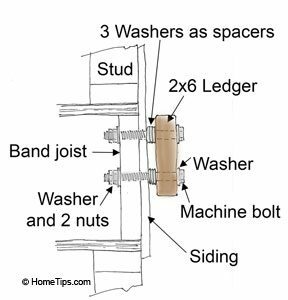 The strongest ledger connection relies on bolts that run through the ledger and the house sheathing and rim or band joist and then are fastened with nuts and washers affixed from the other side. When access to the other side is unfeasible, use lag screws with washers instead of bolts, as shown in the illustration. Temporarily nail or brace the ledger in place, positioned and leveled at the desired height. 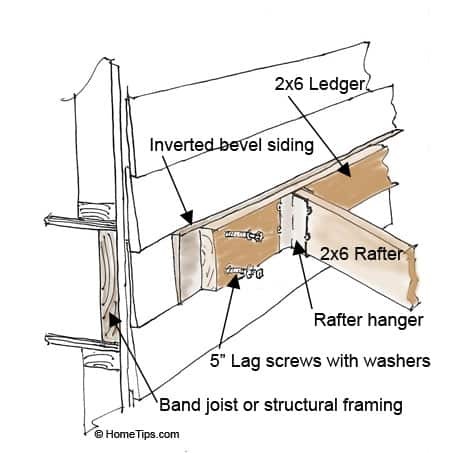 Re-check for level, and then drill lag-screw or bolt pilot holes through the ledger and into the house’s framing. Slip stainless-steel washers between the ledger and the siding to allow water to flow behind the ledger. If you can’t get behind the joist to cinch down nuts, use lag screws. 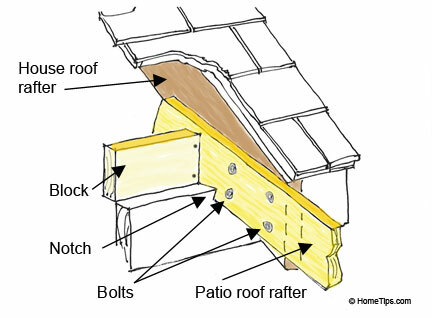 If attaching a patio roof to a ledger beneath the eaves does not allow for enough headroom, you can set the new patio roof’s rafters on the wall’s top plate and fasten them to the sides of the house rafters, as shown in the cutaway drawing above. Anchor a ledger to a masonry wall with expanding anchor bolts. Begin by marking a line across the wall for the ledger’s top edge. Drill holes for the expanding anchors every 16 inches or as specified by local codes, insert the anchors, hold the ledger in place, and tap it with a hammer to indent the anchor locations on its back face. Unless it will be protected from rain by the house’s eaves or a solid roof, a roof ledger that is fastened directly to a house with wood siding should be capped with galvanized metal Z-flashing that tucks up under siding to prevent water from seeping in behind it. Where integral flashing isn’t possible, such as on a stucco wall, use Z-flashing and caulk the top edge. This is a job you must do before fastening the overhead’s roof rafters in place. 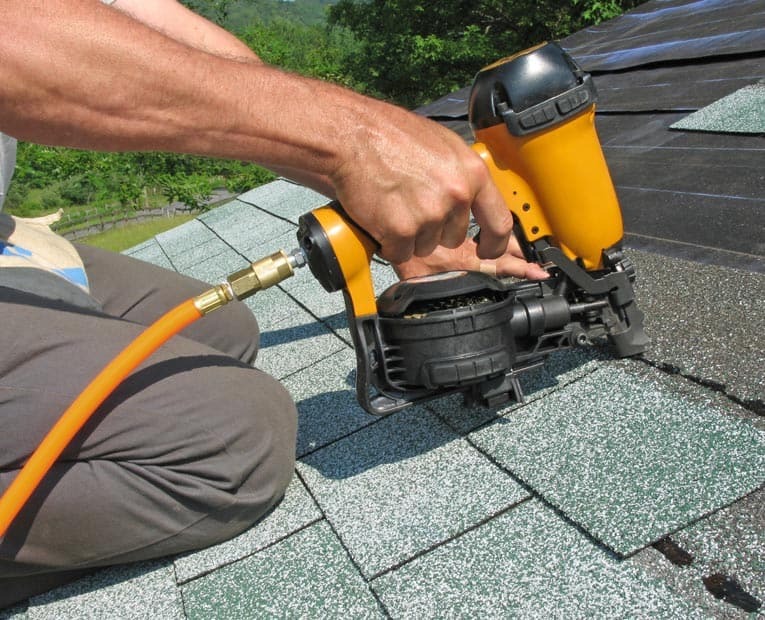 If the house is sided with shingles or lap siding, simply slip the metal’s top edge up under the bottom edge of the shingles or siding as far as possible. If building a patio roof or gazebo yourself is sounds like more than you want to tackle, please see our affiliate partner, HomeAdvisor.